Finally, a new-generation, studio-quality FireWire interface that you can use anywhere! The PreSonus FireStudio™ Mobile combines the superior analog-circuit design and advanced platform technology of our acclaimed FireStudio rack-mount interfaces with the ability to run on bus power in field applications. Now you can have enhanced audio performance for music recording and creation anywhere you can lug your laptop! The FireStudio Mobile is a ten-input, six-output professional recording system that combines two PreSonus XMAX™ Class A microphone preamplifiers; six line-level, analog input channels; S/PDIF digital input and output; MIDI I/O; and headphone monitoring with separate gain control. The FireStudio Mobile beats any and all competition when it comes to flexibility and input count. You can record a whole band with the FireStudio Mobile.The FireStudio Mobile is bundled with PreSonus Studio One Artist, our groundbreaking music creation program, and over 4 GB of virtual instruments, plug-ins, loops, and samples to get you started making music immediately. Here’s a dirty little secret: bus-powered mobile interfaces from other manufacturers deliver much less than the full 48 volts of phantom power that is specified by microphone manufacturers. This means even the finest condenser microphone can’t work at optimal internal gain levels, potentially compromising sound quality even before the signal gets to the mic preamp!PreSonus president Jim Odom and his team of engineers went the extra mile and created an “internal switching power plant” that lets the FireStudio Mobile convert computer bus power into a full 48 volts of phantom power, as well delivering 30 volts to power the superb mic preamps you’ll read about next. 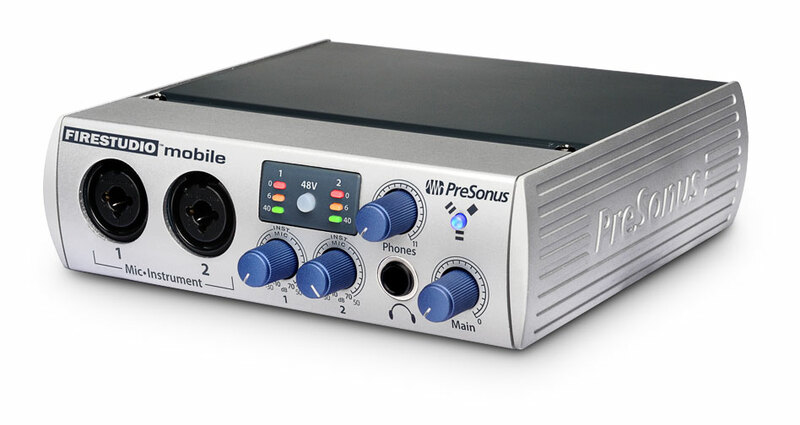 At PreSonus, we know that the mic preamplifier is a key component in the sonic quality of a recording. Many other companies that offer mobile recording interfaces add the cheapest possible microphone preamplifier as an afterthought. In contrast, the FireStudio Mobile includes custom-designed, high-voltage, discrete, XMAX Class A microphone preamplifiers that are suitable for use with all types of microphones.The job of a microphone preamplifier in an audio interface is to boost a microphone-level signal to line level before conversion to the digital domain. A good preamp boosts the level to almost 400 times that of the original signal, making the preamp one of the most important stages in an interface. A cheap, off-the-shelf, op-amp-type mic preamp delivers thin, noisy, harsh results. But with XMAX preamps, the sonic quality is limited only by what microphone you plug into it. For a compact, portable unit, the FireStudio Mobile is loaded with I/O. We start with a pair of combination XLR/TS mic/instrument jacks, which are in the inputs for channels 1 and 2. The XLR mic inputs are routed to the aforementioned XMAX solid-state mic preamplifiers. The high-impedance, TS instrument inputs let you plug guitars or basses directly into the front panel.On the back are 6 more balanced, ¼-inch line level inputs for channels 3 through 8, plus a DB9 connector that accepts a breakout cable (included) to provide stereo S/PDIF digital I/O and MIDI I/O. You get two FireWire 400 ports: one port connects to your computer, and the other can be used to connect a hard drive or to daisy-chain any FireStudio-family interface, including the StudioLive 16.4.2 digital mixer, allowing you to integrate the FireStudio Mobile into a larger system. Like all members of the PreSonus FireStudio family (including the StudioLive 16.4.2 mixer), the FireStudio Mobile comes bundled with Universal Control software. Universal Control is a powerful, flexible, and easy-to-use control-panel application that allows you to daisy-chain to up to four FireStudio family devices for a maximum of up to 52 inputs and outputs (assuming your computer can handle that many tracks).Universal Control consists of the Launch window and the Device window. In the Launch window, you can set the sample rate, clock source, safe mode, buffer size (PC only), and WDM routing (PC only) for all connected FireStudio Mobile-series interfaces. Each device is listed at the bottom of the window, along with Device Window buttons that open each interface’s Device window. PreSonus’ revolutionary new digital audio workstation, with unlimited track count and 4+ GB of 3rd-party resources.